If Spiderman has found a place of esteem in your little boy's heart, mind and imagination, you're in good company. Many children, even girls, go through an intense and lengthy phase of superhero worship, and Spiderman is usually at the top of the list. These cool Spiderman crafts are great for a birthday or Halloween party. 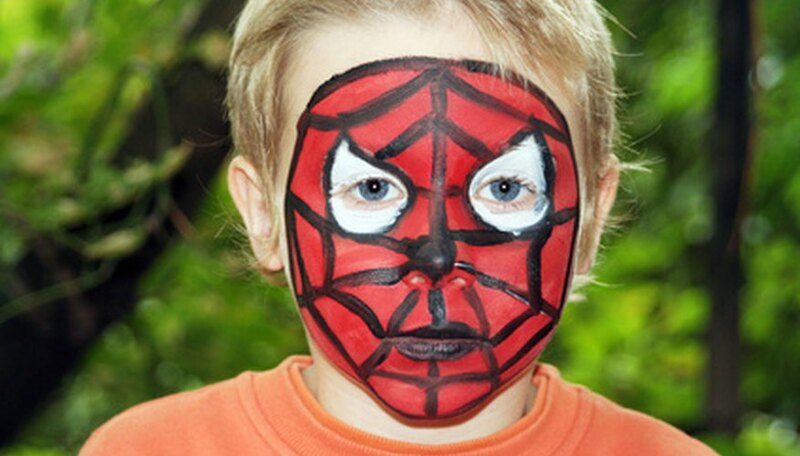 Children love face painting, and it’s easy to give each a Spiderman face. Paint a white area around the child’s eyes. Paint the rest of his face red. Outline the white eye area with black. Add web lines. Take a photo of each child..
Let kids create a simple Spiderman picture frame. This is easily done by kids of all ages. Buy some basic cardboard craft frames and provide the kids with glue and a variety of decorating materials such as glitter, paint, markers, Spiderman stickers, foam spiders, letters and pieces of string for webs. Let each child design his own masterpiece. Once the frames are dry, trim the face painting photo so that it slips easily into the picture area. For the Spiderman web craft, you'll need black, blue and red yarn, black pipe cleaners, large black pom poms, a hot glue gun and plastic googly eyes. You also must allow the kids to turn a room or an area-inside or outside-into a gigantic Spiderman web. Let the kids make the web by weaving the string all over the place, draping it onto pieces of furniture or attaching it to trees and branches. It's best to start by securing the basic form of the web to a central location and then working your way outward. To make the spiders, cut four pipe cleaners in half to create eight legs. Have a grown up use the hot glue gun to secure the legs and the wiggly eyes to the pom poms. After the spiders dry, attach them all over the web and let the kids play in it.